...and he was taking it out on that sweet little girl. Celia: Michael Wazowski! Last night was the worst night of my life, bar-none! I thought you cared about me! Mike: But I thought you liked sushi. Celia: Sushi? Sushi?! You think this is about sushi?! Celia: Oh, Michael, I've had a lot of birthdays, well, not a lot of birthdays, but this is the best birthday ever. What are you looking at? Mike: I was just thinking about the first time I laid eye on you, how pretty you looked. Celia: Stop it. Mike: Your hair was shorter then. Celia: Mm-hmm. I'm thinking about getting it cut. [the snakes in Celia's hair squeal with fear] Mike: No-no, I like it this length. [the snakes sigh in relief] I like everything about you. Just the other day someone asked me who I thought the most beautiful monster was in all of Monstropolis. You know what I said? Celia: What did you say? Mike: I said-- [sees Sulley trying to get his attention] Sulley? Celia: Sulley?! Celia: So, uh... are we going anywhere special tonight? Mike: I just got us into a little place called, um... Harryhausen's. Celia: Harryhausen's?! But it's impossible to get a reservation there. Mike: Not for Googlie Bear. I will see you at quitting time, and not a minute later. Celia: Okay, sweetheart. Mike: Think romantical thoughts. [singing] You and me, me and you, both of us together! Henry J. Waternoose: Well hello, little one. Where did you come from? Sulley: Mr. Waternoose. Henry J. Waternoose: Ah, James. Is this one yours? Sulley: Ah, actually that's my uh, cousin's sister's, er, daughter, sir. Mike: Yeah, it's uh, "Bring an Obscure Relative to Work Day". Henry J. Waternoose: Hmm, must have missed the memo. Mike: Can I borrow your odorant? Sulley: Yeah, I got, uh, smelly garbage or old Dumpster. Mike: You got, uh, low tide? Sulley: No. Mike: How about wet dog? Sulley: Yep. Stink it up. Mike: Hey, Fungus, you like cars? Because I have a really nice car. If you let me go I'll give you...a ride in the car? Fungus: I'm sorry, but Randall said that I'm not allowed to talk with victims of his evil plot. Mike: I'm telling you, Big Daddy. You're gonna be seeing this face on TV a lot more often. Sulley: Yeah, like on "Monstropolis' Most Wanted"? Mike: Ha, ha, ha. You've been jealous of my good looks since the fourth grade, pal. Mike: Painted? Randall: Empty! It'll be empty, you idiot! Roz: I'm watching you Wazowski, always watching, always. Mike: Okay, another Saturday night alone means only one thing: Charades! Your turn, Sulley. Mike: Okay, you're digging, you're digging dirt. Harry, dirt..."Dirty Harry!" Mike: Okay, you've got flowers in the pot. "Harry Flowers"? "Harry Flower Pot?" Mike: Oh, I've got it! "The Sound of Music"! Now playing at a theater near you. Sulley: Movie. Two Words. [Mike starts striking a pose] Star Wars. Mike: How do you do that? Sulley: Hey, Mike, this might sound crazy, but I don't think that kid's dangerous. Mike: Really? Well, in that case, let's keep it. I always wanted a pet...that could kill me! Sulley: Mike, this isn't Boo's door. Mike: Boo? What's Boo? Sulley: That's... what I decided to call her. Is there a problem? 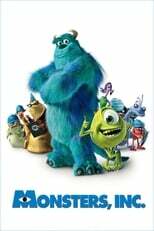 Mike: Sulley, you're not supposed to name it. Once you name it, you start getting attached to it! Now put that thing back where it came from, or so help me--! [everyone looks at him funny] Oh, hi. We're rehearsing a scene for the upcoming company play called, um, Put That Thing Back Where It Came From, Or So Help Me! It's a musical! [sings] Put that thing back where it came from or so help me/So help me/So help me--- and cut! Sulley: Mike... I think she's getting tired. Mike: [smiles] Well, why don't you find some place for it to sleep [suddenly angry] while I think of a plan?! Sulley: See? Ted walks to work. Mike: Big deal. Guy takes five steps and he's there.